In January 1813, just after she had celebrated her seventeenth birthday, Charlotte was told that new governess was to be the Duchess of Leeds and that, since Mrs Udney had also decided to retire, her new sub-governess was to be Miss Cornelia Knight. Charlotte was furious. No girl of seventeen had a governess. And anyway she was a princess. She ought to have her own establishment by now. She ought to have ladies-in-waiting. And one of them ought to be Mercer Elphinstone. But this was never an argument that was going to have any effect on her father. In the last of several heated meetings, in the presence of the Queen and the Lord Chancellor, who had been brought along to add legal weight to the Prince’s prejudices, he informed his daughter that the best he was prepared to do would be to describe Miss Knight as a ‘lady companion’ and not a ‘sub-governess’. The Prince Regent was still determined to treat his daughter as a child. But there was not another man in the kingdom who felt inclined to do the same. There is something quaint and prim about this announcement with its toss of the head at the end; but it shows that the lady was used to standing up for her rights. In time she would have to stand up for Charlotte’s. 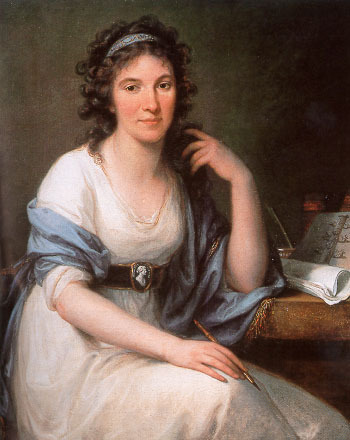 Ellis Cornelia Knight was fifty-six, an Admiral’s daughter, and after his death in 1775 she and her mother had lived abroad, chiefly in Italy, for economy. They were both accomplished and intellectual, a little eccentric in their dress and given to draperies, but as Lady Knight wrote, We have always lived in the best company and not inelegantly … by my daughter’s being the milliner and I the mantua-maker, stay-maker and workwoman.’ ‘Moreover,’ she added, ‘Cornelia is universally esteemed.’ Cornelia was undoubtedly talented: she wrote verses and several learned books, including a sequel to Dr. Johnson’s Rasselas and a novel called Marcus Flaminius, on which Horace Walpole commented, ‘I do protest, I think it a wonderful performance. There is so much learning and good sense well digested, such exact knowledge of Roman characters and manners … that it is impossible not to admire the judgement and excellent understanding of the authoress.’ But he was obliged to admit that ‘as a novel … it is not very amusing’. Miss Knight could no more have written an amusing novel than her contemporary, Miss Austen, could have produced that History of the House of Coburg requested of her by the Regent’s librarian. After Lady Knight’s death at Palermo, Cornelia was rescued from lonely poverty by Sir William and Lady Hamilton, under whose protection she remained for several years. She was prickly in defence of her hostess’s morals. ‘I must say,’ she wrote, ‘that there was certainly at that time no impropriety in living under Lady Hamilton’s roof. Her house was the resort of the best company of all nations, and the attentions paid to Lord Nelson appeared perfectly natural.’ Innocent, earnest Miss Knight saw ‘no impropriety’ in the relationship of this classic pair. After Nelson’s death the Hamiltons returned to England, and Cornelia decided to look for a job. She was recommended by Fanny Burney to the Queen, who was partial to literary ladies, and invited Miss Knight to become a member of her household. In December 1805, at the age of forty-nine, Cornelia became a resident at Windsor, living in Park Street in a house which belonged to the Queen, who allowed her one maid to do the housework. She was paid three hundred pounds a year. Her work at this time was not arduous: most mornings were spent at Frogmore, listening to the Queen reading aloud in French and English, and doing needlework, and she was given generous leave ‘to visit her friends’. Nevertheless, during the course of the next seven years, the strain of living in that unhappy court became more and more unbearable. But the daughter of an Admiral who had served his country for fifty-two years was not one to desert her post, and her tall, angular figure was still to be seen among the Queen’s ladies in 1812 when Lady de Clifford resigned. After the appointment of the Duchess of Leeds and subsequent rows, a little council composed of Princess Mary, the Regent and Sir Henry Halford, the royal doctor and go-between, decided that Miss Knight was just the person to be ‘about Charlotte’. Miss Knight, ill with worry, now wrote to Lord Moira giving up both situations, but Moira urged her to take courage. Two days later he brought Cornelia ‘a positive command’ from the Queen to accept the place offered her. And so, after this stormy beginning, Miss Knight went to Warwick House on January 23, 1813, to begin her life with Princess Charlotte.